If you’re looking to cut cholesterol from your diet naturally, there’s one important step you can take to reduce cholesterol that doesn’t involve any medication: change your diet! One important tip to keep in mind if you want to lower cholesterol is to start thinking of meat as a side dish and make vegetables the main course, according to Harvard Health Publications. Trim the fat off or go for lean cuts of meat. Fish or skinless poultry are other alternatives. When you’re cooking, use oils instead of butter or margarine to cut down on saturated fats. And when using cooking oils, do not use palm or coconut oils, as these contain saturated fats. 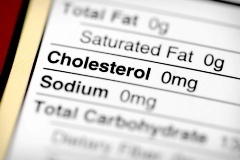 There are other ways you can lower your cholesterol. 1. Exercise: This one is a no-brainer. The Mayo Clinic recommends at least 30 minutes of exercise a day. Going for a brisk walk, hitting the gym or any kind of moderate physical activity can reduce cholesterol levels by up to 10%. Maintaining a healthy body weight contributes to low levels of cholesterol. 2. Niacin: An article posted in The Daily Mail recommends taking three grams of niacin, a form of vitamin B3, daily, as a way to cut down on your cholesterol. However, this can have serious health effects so it is recommended that you take doses of niacin under supervision from a medical professional. 3. Reduce Stress: Stress is linked to elevated levels of cholesterol so find a way to relax and unwind such as yoga, meditation, or relaxing music. 4. Natural Supplements: Though many natural supplements may claim that they reduce cholesterol, there is actually very little evidence that many of these products can back up their claim. But, there are exceptions. An article in US News says that taking two grams of plant sterols daily can lower cholesterol by up to 15%. 5. Quit Smoking: This is just common sense. There is some evidence that smoking can contribute to elevating cholesterol, even if it is slight. 6. Simple Dietary Changes: Eating a diet that is rich in vegetables is an excellent way to lower your cholesterol naturally. Not only that, it also increases the amount of fiber. WebMD recommends soluble fiber, found in oatmeal and fruits such as oranges and apples, as a source of cholesterol lowering fiber. Even though trans fats are being removed from processed food, small amounts can still be found is certain food, such as cooking oils and margarine shortening. An article in US News recommends limiting your trans fats consumption to one per cent a day and paying close attention to the nutritional information on the food you eat as a way to lower your cholesterol naturally. You can add getting eight hours of sleep a night to the ways of lowering your cholesterol. It’s recommended that adults get a minimum of eight hours of sleep a night as a way of giving your body a chance to heal as well as maintaining a low level of cholesterol and blood sugar.